250. The Principle of Soldering.—Soldering is the process of joining pieces of metal by fusing their surfaces together with solder, an alloy of tin and lead. (An alloy is a mixture of metals, brought about generally by melting or fusion.) The solder commonly used is composed of equal parts of lead and tin and has a melting temperature of 401°^,* which is lower than that of either lead or tin. If molten solder is placed on a piece of metal that has been cleaned, fluxed (that is, treated with certain chemicals or materials), and heated somewhat above the melting point of solder, then the solder will spread over the metal and adhere to it. In fact, the solder and the surface of the piece fuse and mix together, forming an alloy of solder and the metal. When two pieces of metal are joined by soldering, the molten solder runs between them, fills up any spaces, and fuses with and penetrates into the surfaces of the pieces. Upon cooling, the solder solidifies and binds the pieces together. 1. The metals to be joined must be thoroughly cleaned of all grease, dirt, and oxide or tarnish aad kept clean (usually with the aid of fluxes). 2. The pieces themselves muat be heated and kept somewhat above the molting point of solder for a short time. If insufficient heat is applied to the pieces, the solder will not intermix well with the surfaces being joined, and poor work will result. 1 Machinery's Handbook, p. 1380, 8th ed. takes place much more rapidly. Therefore, after a piecc is cleaned, a flux, usually in the form of a liquid or paste, is applied to exclude the air and thus prevent oxidation until the part- can be soldered. Most fluxes also have a certain solvent action to remove any oxide not removed by mechanical means. Some fluxes have a very strong solvent action, and can be used to remove oxides without first scraping the work. Such fluxes are usually quite corrosive, however, and their use is advised only when necessary. Flux also fills the space between the soldering iron and the piece being soldered, and thus better enables the heat to flow from the iron to the work. Fig. 224.—One of the first steps in soldering is to clean the work thoroughly. This may be done by scraping with a dull knife. A flux, therefore, may be considered as facilitating the soldering process in the following ways: (1) removing oxides, (2) preventing oxidation while the work is being heated, and (3) aiding the flow of heat from the soldering iron to the work. 252. Kinds of Fluxes.—Various materials in the form of pastes, liquids, or powders are used as soldering fluxes on different metals. Soldering pastes under different t rade names are available at hardware stores. They are compounded from various materials, and most of them make excellent fluxes for most common metals. They are easily applied and are. generally less mussy and less corrosive than liquid fluxes. Muriatic acid (commercial hydrochloric acid) is a very effective flux for soldering galvanized iron and zinc. It is sometimes used also for iron and steel. It may be bought at drug stores. Because of its corrosive nature, muriatic acid must be used sparingly and with care. 1. Drop small pieces of zinc into a bottle about half full of muriatic acid, adding more pieces from time to time until no more zinc will dissolve and there is a slight-cxcess of zinc left- in the bottle. The resulting liquid is zinc chloride. Zinc may be obtained from aji old fruit jar lid, or the shell of an old dry cell battery. Zinc from such sources should be carefully cleaned before using. 2. After all chemical action has stopped, strain the zinc chloride through a cloth, or allow the dirt to settle and pour off the clear liquid. 3. Dilute the zinc chloride with one-fourth to one-half its volume of water. Care should be token not to get the acid on the hands or clothing. Neither acid nor zinc chloride should be kept around tools; nor should zinc chloride be made around tools, as the vapors or fumes will cause severe corrosion. If acid or other flux should be spilled on tools, it should be wiped off at once and a liberal coating of grease or oil applied. Rosin is sometimes used for soldering bright tin. A small quantity of powdered rosin is sprinkled on the part to be soldered, and when the hot soldering iron is applied, it melts and spreads over the surface. Rosin is a very mild flux. It is used where extreme caution must be taken against corrosion. Tallow is a good flux for soldering lead. After the lead is thoroughly scraped, it should be heated slightly, after which the tallow is applied to the warm surface. Sal ammonia-c is a good flux for brass and copper. It is commonly used in cleaning and tinning soldering irons. It may be obtained in cakes or in lumps or powdered form. 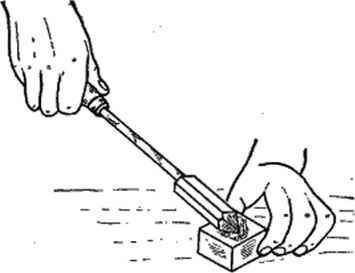 A teaspoon of powdered sal ammoniac, or the equivalent in lump form, dissolved in water, makes a good cleaning solution into which soldering irons may be dipped quickly while hot and thus cleaned. Small cakes of sal ammoniac, especially prepared for cleaning and tinning irons, are available at hardware stores. These are quite satisfactory and their use is generally recommended. 253. Applying Fluxes.—Liquid fluxes can be easily applied with a medicine dropper or a hollow glass tube. By lowering the tube down into the bottle of flux, and then placing a finger tightly over the upper end. a small amount of flux may be held in the bottom end of the tube and transferred to the metal being soldered. Small brushes can be used for applying fluxes that arc not too corrosive. 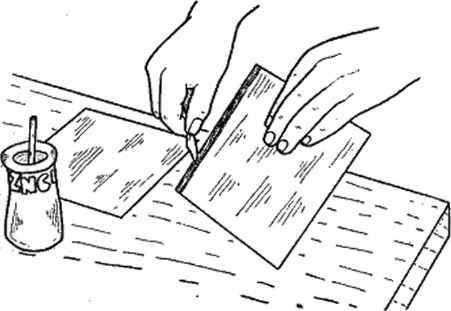 Paste fluxes may be spread on the work with a small piece of wood, such as a match stick, preferably after the work has been heated slightly. Care should be taken not to use more flux than necessary, nor to get the flux on parts not to be soldered, because many fluxes are corrosive, and all of them are somewhat mussy. 254. Kinds of Solder.—Solder is available in the form of bars, solid wire, hollow wire filled with a flux core, or ribbon. For large jobs requir ing considerable solder, it is usually bought in bars. For the occasional repair job on the farm, acid-core wire solder or paste-core wire solder is very convenient and usually more satisfactory. Flux-core wire solders are more expensive than plain solder, but where only a small amount of soldering is to be done, the added convenience of having the flux in the solder is well worth the small extra cost. Fro. 225.—After the work is cleaned, flux is applied. Liquid fluxes can be applied easily with a medicine dropper or a hllow glass tube. 255. Soldering Irons.—Soldering irons are really made of copper. In fact they are sometimes called soldering coppers. Copper is used because of its resistance to oxidation and corrosion and because of its ability to readily absorb and give up heat. The best size of iron for average farm shopwork is one that weighs about 1 lb. In general, the larger the iron that can be conveniently handled, the better. Large irons require heating less often. An iron that is too large, however, is clumsy and cannot be handled with ease. 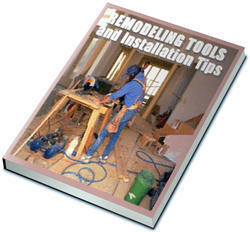 Electric soldering irons may be used if electric current is available. They are somewhat more expensive than ordinary irons, however, and are not generally used for occasional jobs of soldering in the farm shop. 256. Heating the Soldering Iron.—The gasoline blowtorch is quite satisfactory for heating soldering irons on the farm. It furnishes a clean intense flame, and it can be readily taken to wherever it is needed. Any kind of heat that is reasonably clean, however, may be used for heating soldering irons. For occasional use, irons may be heated on a gas, gasoline, or kerosene cook stove, in a coal stove, blacksmith's forge, or even in a wood or coal fire built on the ground. When a coal or woodfire is used, it is best to allow it to burn down to glowing coals, so as not to smoke the iron or get it dirty; or a short piece of pipe may be put into the fire, and the iron heated inside the pipe in order to keep it clean. Pio. 226.—The gasoline blowtorch is oommonly uacd for heating soldering irons. 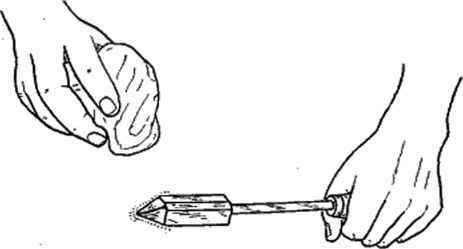 Once an iron is heated» it may be kept at working temperature without overheating by pulling it bark out of the flame as at A. If the point of the iron change« from a silver to a yellowish color, it is too hot. 267. Cleaning and Tinning the Soldering Iron.—By tinning an iron Is meant simply coating the faces of the pointed end with solder. Good work cannot be done unless the iron is kept well tinned. Every one who expects to do soldering work should therefore become proficient in tinning an iron. Fig. 227.—A clean, well-tinned iron is essential. If the surface of the iron is pitted or rough from overheating, it may be smoothed and cleaned by filing, either while hot or oold. If the surface of an iron is pitted and rough from overheating, it may be smoothed and cleaned by filing, either while hot or cold. In extreme^ bad cases, the end of the iron may be hammered, hot or cold, to smooth and reshape the point. Care should be taken not to get the point too long nor too short but to retain the original shape. 3 drops of molten solder on a cake of sal ammoniac. Another way is to dip the hot iron quickly into a cleaning fluid (which can be made by dissolving sal ammoniac in water), and then to rub it in molten solder. pig. 228.—Rubbing a dean hot iron in a few drops of molten solder on a cake of sal ammoniac is a good way to tin it. Fio. 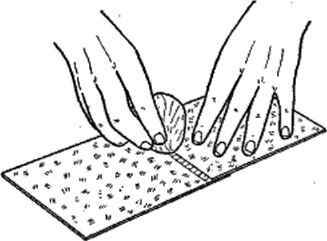 220.—In order to keep the iron clean, it should be wiped quickly with a clean, damp cloth frequently while soldering. be rough and lumpy, rather than smooth arid mirrorlike. It will be difficult, or impossible, to heat the work up to the melting point of solder, and consequently a poor bond will be formed between the solder and the metal. worthless for soldering, and it must be retinned. If the tinning begins to turn from a silverish to a yellowish color it is getting too hot and should be removed from the flame or placed in a cooler part of the fire. Therefore, an iron should be heated until it will readily melt solder, but not so hot that the bright tinning on the point begins to turn yellow. Any time that the iron becomes a little dirty it should be cleaned while hot by (1) wiping it quickly with a clamp cloth, by (2) dipping it quickly and only for an instant into a cleaning fluid, or by (3) rubbing it on a cake of sal ammoniac. The iron will usually need such a cleaning immediately after every heating. Fig. 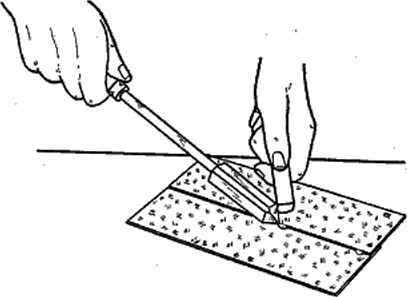 230.—The whole facc of the soldering iron—not juftt the point—should bo pressed firmly against the work. of solder, otherwise only rough, poor work can be expected. Failure to observe this principle frequently accounts for the difficulty experienced by many beginners, especially when working on large pieces. For ordinary work, the heat is applied by pressing the soldering iron firmly against the metal to be soldered. The flat face of the iron—not. just the point—should be held against the metal. The iron should be moved slowly over the work, so as to allow time for the heat to flow from the iron to the metal. Heat may also be applied to the work by the direct flame of a torch. Tills method is especially good when working on large pieces. 260. Applying Solder to the Work,—Generally the best method of applying solder to small pieces is to pick it up on the iron, a drop or two at a time, and transfer it to the work. To get solder from a bar to the iron, allow the bar to project over the edge of the bench, or a block or brick on the bench, and bring the hot iron up against the bar from beneath, melting one or two droj>s ofF onto the iron. Where considerable solder is required, it may be melted off the end of a bar and allowed to drop directly onto the piece being soldered; or the end of the bar may be held against the point of the iron as it is drawn along slowly over the work. When using wire solder, the iron is put in place on the metal to be soldered and then raised slightly at the heel to allow the wire to be fed under it. 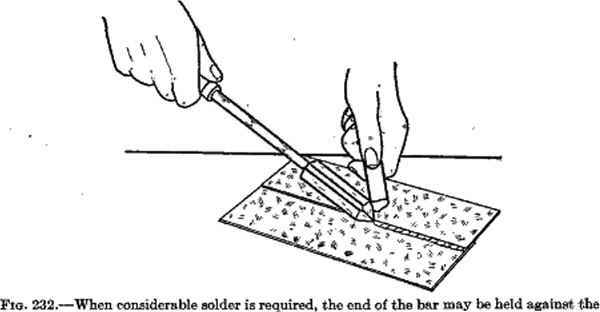 end oi a bar of solder. 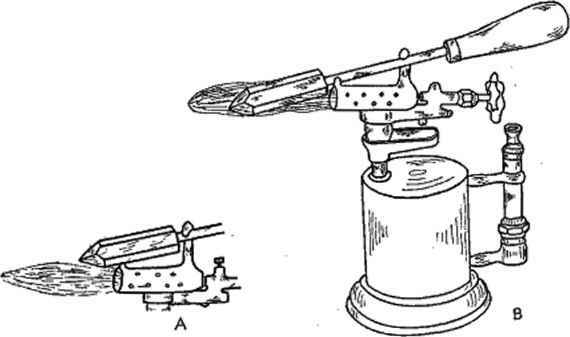 point of the iron as it is drawn along slowly over the work. Fig. 233.—In using flux-cored solder, apply it to the work and to the face of the iron in contact with the work. In this way the flux does not evaporate or waste away before reaching the work. Fig. 2.34.—The work should be kept clean by wiping occasionally with a damp cloth. When the job ia done, aU excess flux should bo wiped off to promote cleanliness and prevent corrosion. put on, because the metal tarnishes or oxidizes very rapidly when hot. When the job is completed, all excess flux should be wiped off. This is especially important if acid or other corrosive flux has been used. 262. Repairing Small Holes—The metal should be thoroughly cleaned around the hole, and then a suitable flux applied. A drop of solder may then be melted over the hole and smoothed out with a clcan, well-tinned iron. Finn pressure should be used and the iron should be moved about slowly so as to thoroughly heat the metal around the hole. Sometimes it works well to put the point of the iron straight down into the hole and rotate it back and forth slowly. Fro. 235.—a amaii bole may be copper or galvanized rivet- inserted and EttSZtl wis hammered doWn. The rivet, of course, hot iron back and forth slowly should be clean. Flux is next applied and with the point in the hole. golder fc flowed over fche rivet ^ aroimd the hole. By careful work a smooth, neat job results. Fio. 236.—An effective way of repairing a medium-sized hole is to clean the metal around the hole, Insert a rivet, and then apply »older. until the solder cools. A tempered tool, such as a screw driver or an awl, should never be used for this purpose, as the heat will draw the temper. Also the flux will likely cause the tool to rust. It may be necessary to add a little solder around the patch to make a smooth job. Care will have to be used not to melt the whole patch loose. Use a well-tinned, hot iron, and do not hold it in one place too long. Work on first one edge of the patch and then the other. In this way, there is less danger of melting the patch loose. In repairing a hole in a pail or vessel, it is always a good plan to solder both the inside and the outside of the patch, so as to leave no rough surfaces to catch and hold dirt. Fia. 237.—In soldering a lap joint, it in best first to "tack" the piecea at intervals and then solder the remainder oi the seam. little solder at intervals along the joint. The hot iron is then moved along, keeping it pressed firmly against the work while solder is fed into the seam by touching it to the iron. If the pieces have a tendency to melt apart, they may be held together with the end of an old file or a piece of scrap iron while the solder cools. 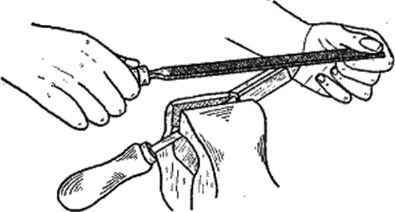 For many jobs a hook or lock joint may l>e used, thus eliminating any difficulty in keeping parts together while soldering, as well as making a. stronger joint. See Art. 271, page 194. Fio. 238.—a leak in a tube may be snugly around the tube and soldered in place; or clean, bright copper wiro clean wire; and (3) applying solder may be wrapped tightly and closely over the wire. around the tube a short distance both ways from the leak, and then solder flowed evenly over the wrapping. 267. Soldering Aluminum.—Soldering aluminum is quite difficult, and success can be insured only by very careful work. Only special aluminum solder and special flux, or a special fluxed solder, should be used. Such solders are commonly furnished with directions for use, and these should be carefully observed. The first step in soldering aluminum is to thoroughly clean the parts to be soldered. Since aluminum conducts heat away so much faster than most common metals, care must be taken to thoroughly heat it. A heavy iron is therefore better than a small one. The iron should be heated somewhat hotter than for ordinary soldering. It is sometimes advisable to plajr the blowtorch on the iron while it is in use, or even to heat the metal directly with the flame. To tin aluminum, some of the special solder is melted onto the surface and then a clean, hot, well-tinned iron is rubbed firmly and slowly back and forth in the molten solder. If the .solder does not adhere to the metal, quickly wipe off the molten solder with a small piece of steel wool, and then apply more solder and continue to rub with the iron, being sure the iron stays clean and hot. The foregoing methods will be found helpful also where old rusty or dirty metal must be soldered. 268. Causes of Difficulty in Soldering.—The following are common causes of difficulty or failure in soldering. 1. Lack of thorough cleaning of parts to be soldered. 2. Failure to keep parts clean by occasional wiping with a damp cloth during soldering process. 4. Use of iron that is not hot enough (leaving rough work). 5. Use of dirty, poorly tinned, or overheated iron. 6. Failure to apply a little flux after every application of the hot soldering iron. 7r Failure to sufficiently heat t he pieces being soldered. 8. Failure to wipe off excess flux when the soldering is done, resulting in later corrosion. Fxo. 239.—A. The hook or lock joint is a good method of joining pieces of sheet metal. It is easily soldered. 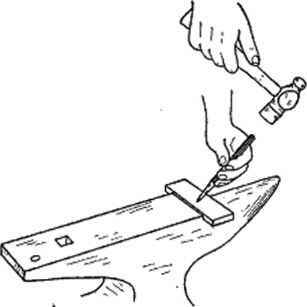 B. Bendi for the hook joint are easily started by extending the metal over the edge of a bench or anvil and tending with a hammer or mallet; or by clamping the metal between irons in a vise and bending. arcs are marked with dividers. A square should be used to insure accurate marking of lines at right angles. 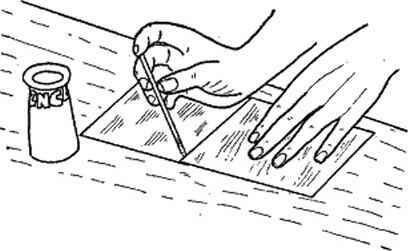 In marking out patterns for many appliances, it is best to lay off two base lines at right angles to each other and to do all measuring and squaring from these; or to straighten one edge of the stock and square one end with it and then use this edge and end as base lines.